Bespoke tailor Jeff Banks is giving one lucky reader of Hello Magazine the chance to win £10,000 worth of men's wedding suits for four people at their nuptials. Jeff Banks has been at the forefront of British fashion through five decades. He has won numerous awards and citations around the world. March 2015 saw Jeff Banks achieve a lifelong ambition to open a store on the prestigious Savile Row. The craft of bespoke tailoring encapsulates everything that Jeff holds precious in the design world. The feel of a suit made in the finest fabric and cut to your very own measurements is something thats hard to surpass or forget. Wether it's a suit for work, a wedding or any other special occasion, expert tailors will guide you through every step of this sartorial journey. The unique experience of enjoying something that is completely created exclusively for your own personal requirements is not to be missed. 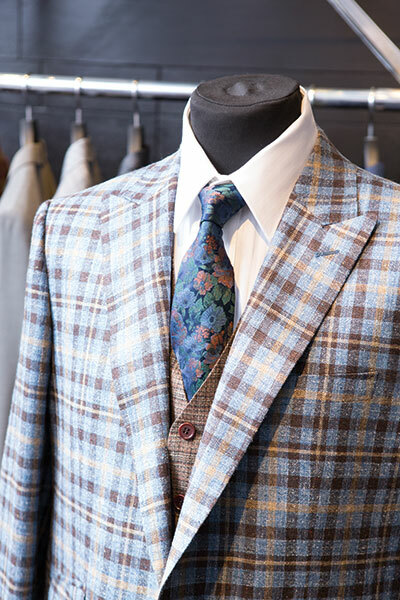 The prize includes a Jeff Banks bespoke suit for the groom, best man, father of the bride and father of the groom. This will also include beautiful custom-designed ties and pocket squares (choose from 25 different designs) with made-to-measure shirts. This amazing package also includes all train fares to London and back for the fitting, as well as lunch with Jeff Banks in Savile Row. Don't miss out on this epic prize - enter the competition now. Good luck! TERMS AND CONDITIONS:Entries must be received by the closing date of Sunday 5th March 2018. The prize consists of Jeff banks bespoke suits for Groom, Best Man, Father of the Bride and Father of the Groom. Custom designed ties and pocket squares, 25 of each, made to measure shirts. The prize also includes all train fares to London and back, as well as lunch with Jeff Banks in Saville Row. The prize is as stated and consists of one winner. The prize is non-transferable and cannot be exchanged for cash, gift card or other alternatives. A winner will be notified by email within 14 days of the closing data and must respond within 14 days. For full terms and conditions, please visit hellofashion.com/win.